After a few very busy weeks, Dustin and I knew we didn’t want to do anything major for New Years Eve. We decided to have a couple friends over to celebrate in our new house. This decision was made for 2 reasons. 1. We really wanted people to see our house even though it is no where near where we want it to be. 2. It forced us to get more organized and make the house feel more homey so that people could actually stay here. It’s amazing how putting out a few lamps and hanging some pictures can make such a big difference. 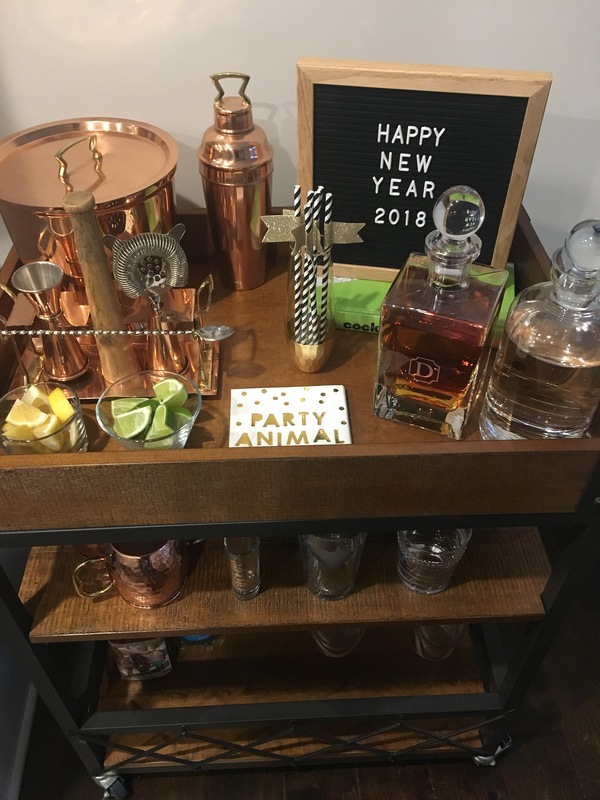 It certainly wasn’t much, but it was so fun to host our friends and enjoy each other’s company while ringing in the new year! Hosting people is something I definitely want to do more of in 2018. 2017 was such a great year with many firsts for Dustin and I. I started this blog and have had tons of fun doing it. I’ve gotten to meet so many cool people that I otherwise probably never would have crossed paths with. For that I am very grateful. As we jump into 2018 I am doing my best to stay present and not spend as much time on my phone and computer as I did in 2017. This certainly does not mean the blog is stopping. Quite the opposite actually. I am committing to being more focused, planning better, and dedicating specific time to Lindsey in the Queen City. I think this will lead to content y’all will love and a more sane mind for myself. I am so thankful to those that have supported me through this crazy blogging journey and I mean it when I say, the best is yet to come! Can’t wait to see what 2018 has in store for my fave blogger! It’s going to be a good one! Starting with a new baby for me to spoil!